Would you like free plans for a gas-powered 4-cycle engine that is a proven and easy-to-build design? 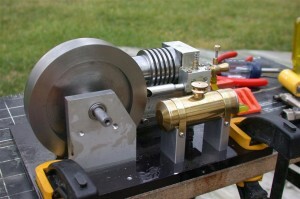 Joe Webster designed this engine to be quick, inexpensive and easy to build. It doesn’t have any parts with super-critical dimensions and you don’t need a rotary table or other expensive tooling to construct it. The plans are well drawn and include two pages of construction notes. This is what is known as a “bar stock” engine, which means it does not use any castings. It uses flat and round metal stock that can be purchased from almost any metal or machine shop supplier It is not a big engine so the cost of the metal should be modest. Joe suggests making the 3.75-inch diameter flywheel out of an iron dumbbell purchased from Wal-Mart to save money. The engine uses some components that need to be purchased, like a couple of gears, a spark plug, points, condenser, ignition coil and piston rings. The part numbers and vendors are listed on the plans and they are all readily available, I’ve checked. Joe recommends you also buy and use a carburetor for a radio-controlled car engine, although he does include drawings so you can make one if you want. Unfortunately, Joe’s website seems to have disappeared but you can still download the plans here. i believe you may be interested in my 11/2 volt ignition units, that i had sandown exibition. send me an email. Would you please send me plans for this engine? Hi: The PDF file download goes into a loop and the engine plans will not download. Can you e-mail a set of DWG ACAD drawings to me in stead. BTW, I tried downloading the PDF version and didn’t have a problem. Here’s a nice builder’s log for a Webster engine that was built someone who says he could hardly spell “lathe” two months before he built it in 8 days.